Cherry Garcia is a flavor of Ben and Jerry’s ice cream that was developed as a kind of tribute to Jerry Garcia, but it is so popular (it is the brand’s top selling flavor) that at this point the name can almost act as a stand in for anything with bing cherries and chocolate chunks and people will know exactly what flavors they’re going to be getting.Here, I used both dried bing cherries and dark chocolate chunks in a simple biscotti recipe. This recipe is my favorite for biscotti, as it turns out cookies that are crispy and crunchy – absolutely perfect for being dunked in a cup of coffee or tea – but not so hard that you’ll break a tooth biting into one without dipping. In fact, they almost seem to shatter in your mouth when you bite into them. The secret to achieving the texture is not to over-handle or over-flour the dough as you work with it. Once you have mixed all the ingredients together, drop spoonfuls of dough onto a parchment-lined baking sheet in a log shape, then gently press with floured hands into a long, flat rectangle. Use only enough flour to prevent the dough from sticking to your hands. Then bake the logs, slice them into individual cookies and bake again until dry. My biscotti are quite long (again, I do this so they’re easy to dip), but if you prefer shorter, smaller cookies you can certainly shape the logs of dough into any size rectangle you like. The second baking time will probably be less for a significantly smaller cookie, so just keep an eye on the oven as you work. Biscotti are a fantastic cookie to send as part of a holiday gift because, packed in an airtight container, they can last for a few weeks and still maintain their freshness. Not that they’ll last that long, of course, but it’s nice to know just in case. Whisk together flour, baking soda, baking powder, salt and nutmeg in a medium bowl. In a large bowl, beat eggs, adding sugar gradually, at medium speed until smooth and fluffy, 2-3 minutes. Beat in vanilla extract. At low speed or by hand, stir in flour mixture followed by cherries and chocolate. Drop spoonfuls of batter into long lines on prepared baking sheet and, with well floured hands, shape the irregular lines into rectangular logs about 1/2 inch high. Length and width are your prerogative, and you can use more than one baking sheet, if necessary. Bake at 350F for 20 minutes, until logs are a light gold color and are fully set (they will spring back slightly when touched with a finger). Slice logs into 1/3-1/2 inch thick slices (1-1.5 cm) and lay flat (on their sides) on baking sheet. Lower oven temperature to 300F. Bake sliced cookies for 15 minutes, flip them and bake for an additional 15 minutes. If cookies are not firm, depending on how thickly they were sliced, turn again and bake for 10 more minutes. Remove to a wire rack to cool. Store in an airtight container. I have always wanted to try to make biscotti & this sounds like ingredients I’d enjoy! I just adore the combination of cherries and chocolate, and think it’s so festive, too. These would make a great Christmas gift. I have bookmarked this biscotti recipe as one to try Nicole!!! hi! this is a wonderful recipe but when i tried it, i ended up with rather tough and eggy tasting biscotti. could it have been due to the fact that i over-beat the eggs? i swopped the cherries and chocolate for whole almonds. should i reduce the number of eggs to 2 or 1.5? thanks for all your delicious looking posts! i love this place. oops, FYI the instructions omit the step to add the vanilla, I just finished baking a batch and upon tasting it noticed it was missing something. Once I checked the recipe I noticed that vanilla is listed in the ingredients but NOT in the step by step instructions. Still tastes good, would have been great with that vanilla. Just wanted to tell you that I tried this recipe last week and it turned out excellent! So excellent that it actually converted three “I hate biscotti” people into fans. They were fighting over the last ones! My variation was to use pistachios instead of cherries, and then at the very end, I swirled in about 1/3 cup of nutella, so it streaked the dough (I didn’t really incorporate it fully, but just let it kind of diffuse itself when I rolled it into the log). Almost looked professional coming out of the oven! Hello – what a gorgeous recipe! 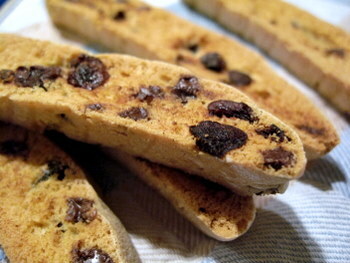 I am planning to make biscotti for a special friend’s. She + her husband are real foodies. In my research I’ve seen various opinions on whether biscotti with or without butter is more authentic/traditional italian. Thoughts? What would the difference in the finished product be? Bugger… I missed the vanilla too! They’re in the oven right now, we’ll see if we miss it. Perhaps revise the recipe for others… though my mum would say I should have had all my ingredients out before starting + then would have noticed.